Old South is home to a vibrant array of vocal, choral, and instrumental music in worship and concerts. We believe music to be a primary means by which we worship, love, and serve God, and acknowledge its unique ability to “thin the veil” between Earth and Heaven. No matter your age or ability level, there is a place for you in our music ministry. Find out more about our ensembles and programs in the sections below. Rehearse: Thursdays, 6:30 to 8 p.m.; Sundays, 10 to 10:45 a.m.
For those able to commit to regular rehearsal attendance, Festival Choir offers unparalleled opportunities to explore and perform a dazzling array of choral literature at a high level. Our dedicated group of volunteer singers supported by Old South’s professional Choral Fellows presents music each week at Festival Worship from September through June, as well as for special services during Christmas and Holy Week. Summer Choir: Beginning in June and continuing through Labor Day, Festival Choir suspends Thursday rehearsals, inviting all who wish to join us Sunday mornings at 10 a.m. to rehearse music for that day in worship. Contact Mitchell Crawford (mitchell@oldsouth.org) for more information. Rehearse: Sundays, 8:30 to 8:55 a.m. This ensemble of First Worshippers and those who appreciate great music but may be unable to commit to weekly rehearsals presents music at First Worship each week. If singing makes your heart soar, you are warmly invited to join us — no experience necessary! Rehearse: Sundays, 9 a.m. or 11 a.m. Note: Youth Group students are welcome to join in to children’s music as helpers. Several members choose to sing at 11am Children’s Music. Contact Amy Budka (childrenschoir@oldsouth.org) for more information. 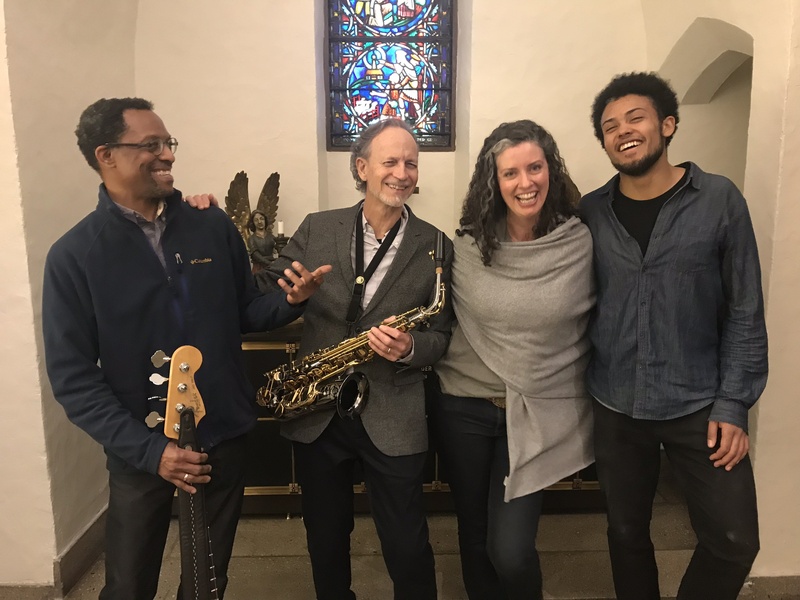 Under the direction of Tim Harbold, we provide a soulful ministry of music, inclusiveness, and diversity, singing once a month at Jazz Worship. The choir participates in our annual Martin Luther King celebrations. Contact Tim Harbold (tim@oldsouth.org) for more information. Saxophonist Willie Sordillo directs the band, featuring singer Zoë Krohne, that leads Thursday evening Jazz Worship and other special services. While jazz and gospel are the group’s mainstays, their repertoire is broad, encompassing folk, blues, popular and world music traditions, and classic hymns. Rehearse: Tuesdays, 6:00 to 7:30 p.m. 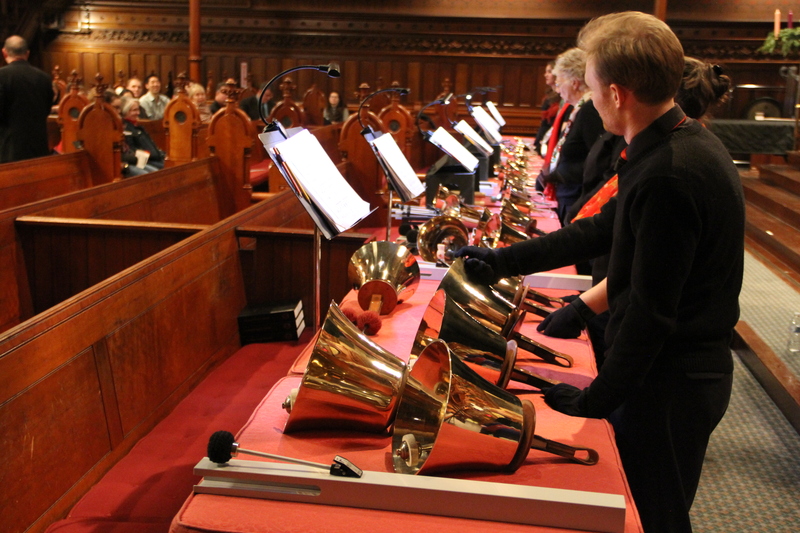 Under the direction of Peter Coulombe and utilizing Old South’s substantial collection of handbells and chimes, we perform during Festival Worship Service once a month from September through June, as well as for special events — including Christmas and Spring Concerts. All skill levels welcome! Contact Peter Coulombe (handbells@oldsouth.org) for more information. Each year, Old South welcomes a number of guest performers from around the world to participate in Festival Worship. Choirs and other ensembles interested in performing for a service at Old South should review the information contained in our Visiting Ensembles form. The E. M. Skinner pipe organ that graces our sanctuary is one of the largest in the region, comprising some 115 ranks and over 7,000 pipes. The organ is at the center of Festival Worship’s music: on an average Sunday, at least a third of the service employs the organ. Whether accompanying hymns and anthems, or in voluntaries marking the beginning and end of worship, Old South wouldn’t feel the same without the soul-stirring, room-shaking sensation of the E.M. Skinner organ. Learning of the instrument’s availability mere weeks before the Municipal Auditorium was to be razed in 1982 (with the organ still inside it! ), Old South resolved to undertake the enormous task of rescuing and relocating the organ. A salvage team quickly formed to remove and store the instrument, consisting of crews from the firms of Nelson Barden Associates of Boston, A. Thompson-Allen Co., and Foley-Baker Inc.
With the heroic removal effort completed, attention turned to how the organ might be installed in the church. Consideration was given to housing the instrument in the rear gallery, but Old South was ready to have music take pride of place in the chancel alongside the clergy. As the instrument was originally designed for a quite different space than our own, a variety of tonal and mechanical changes were necessary to fit the Skinner to its new home at Copley Square. Such a job being beyond the capabilities of local restorers, the firm of Casavant Frères, Ltée. (Stainte-Hyacinth, Québec, Canada) was chosen to manage the reconfiguration and installation. Around the same time, Old South’s existing organ was sold back to the Reuter Organ Co., who reworked it for installation in St. John's Lutheran Church, Winter Park, Florida. Even after Op. 308 safely was ensconced at Old South, additional rebuilding and restoration was necessary to return the organ to optimal condition. Nelson Barden Associates began the rebuilding program in 1986, made formal in 1987 under consultants Jack Bethards, Joseph Dzeda, and Jason McKown, with guidance from officers of Old South. This particular campaign of work saw completion in June 1990, in time for the American Guild of Organists National Convention in Boston. In 1993, the Antiphonal organ received all new pipework from Austin Organs, Inc. Nelson Barden Associates renovated the console in 1999, installing a new solid-state combination action. The restoration of the organ, now stewarded by curator Jonathan Ambrosino, is ongoing. After the construction of Gordon Chapel was completed in 1932, the Æolian-Skinner Organ Company was contracted to build a new organ of special, compact design for the limited space available. Fourteen sets of pipes were ingeniously installed into inhospitably-shaped chambers. Despite the cramped conditions, the organ’s warm and engaging tone was always considered something of a triumph. Dr. Carl McKinley, Old South’s organist at the time, was so delighted with the results that he wrote an article praising the organ in the May 1933 issue of American Organist. Originally a three-manual instrument, the original console (gutted, but with its original ivory hardware) still lives in the parish house basement. In 1983 this instrument was rebuilt by Casavant Frères, Ltée. and provided a new, two-manual console. Great, Choir and Pedal were made unenclosed at this time, with the stops of the Choir division transferred to the Great. A tonal renovation was undertaken in 2007, whose goal was to return all available pipes to their original locations and voicing. This project removed two mixtures added by Casavant, restored the Gemshorn and Great Twelfth (permitting the original Grave Mixture to be heard), and re-regulated all stops. The organ is now as it was tonally in 1933, with three exceptions: the Great, Choir and Pedal remain unenclosed; the Swell contains a Casavant III Plein Jeu, revoiced as a two-rank mixture; and the Choir Dulciana is absent. One of four grand pianos used by the church's broad and varied music program, the Mason and Hamlin Model BB was located for decades in Mary Norton Hall, where it long accompanied sing-alongs, Christmas pageants, cabarets, and musical theater and operatic productions. Decades of frequent use had taken a considerable toll on the instrument; it was fully restored by artisans at the North Bennet Street School in 2011. Now located in Gordon Chapel, it regularly supports the rehearsal and performance needs of Old South's varied ensembles, as well as a whole host of outside groups and artists. Work on the instrument was made possible by a bequest from the estate of Waldo "Mac" McClure Libbey, an emeritus professor of electrical engineering at the University of Maine, who sang for two years with the Old South Choir while doing graduate study at Harvard and MIT in the late 1930s or early ‘40s.